Did you get our leaflet on rock walls in the Echo today? Here’s the text – we tried to upload as a PDF but something odd is happening – will remedy soon. Rock wall at Belongil — ACT NOW or we will lose our beaches! Belongil high tide Feb 2013 – no sand in front of the rock wall. Over time the sand there will be completely gone. Byron’s beaches attract residents and tourists to our bit of paradise but we stand on the brink of losing them. 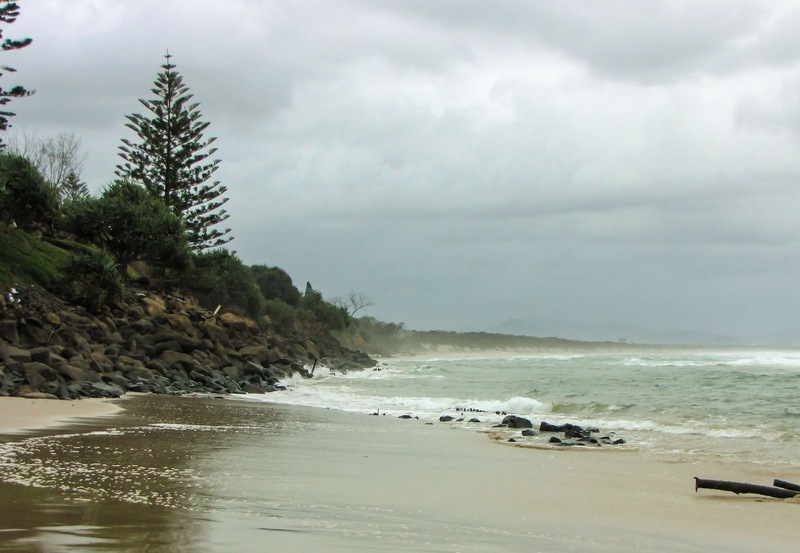 Without any community consultation, Byron Shire Council recently voted to build a rock wall at Belongil in a move that overturns 30 years of management of Byron Shire coasts. This move is the first in a plan to spend millions to build new rock walls along the length of Belongil, build groynes out to sea to try to trap sand and then pump sand from Cosy Corner to feed Belongil. If we go down this path there is no going back! What is the immediate issue? Council has voted to build “Interim Beach Access Stabilisation” (IBAS) works – or, more plainly, at least 100m of new rockwall at Belongil Beach. The stated reason for the works is to maintain “beach access” yet Council could use moveable wooden or metal stairs as is done at other beaches. This would allow adaption with a changing coastline and be significantly cheaper. Rock walls will accelerate the erosion of the beach, a point affirmed by the NSW Coastal Panel, which also identified that the works could lead to loss of amenity and create public safety concerns and impact on adjoining Crown Land. The works are described as “interim” but there is no timeframe or plan for their removal. How can they do this without community consent? Council is using a State planning process the Infrastructure State Environmental Planning Process (ISEPP). Council is both the applicant and the approval authority. It enables Council to over-ride its own Development Control Plan (which prohibits the use of rocks) and negates the requirement for detailed assessment and community consultation. It also avoids the requirements of the Coastal Protection Act 1979 and the Environmental Planning & Assessment Act 1979. What’s a CZMP and why do we need one? A Coastal Zone Management Plan is a plan prepared by Council that identifies how we will manage coastal issues, notably coastal erosion and recession and emergency management. The rock wall has been approved outside a CZMP despite the fact that Council is currently preparing one, which is due to be completed within a few months. It is the state government which gives approval for a CZMP and any liability for decisions made under a CZMP (eg a rock wall) becomes a state responsibility, not Council’s. Why is Council in a hurry to rush through an ‘interim’ rock wall when the CZMP is in the pipeline? We don’t know, especially since it is a lot of our money for a temporary structure. The CZMP process gives the community a chance to have their say about how our beaches are managed. It will also provide legal impunity for Council; landowners whose properties have been affected by erosion caused by rock walls have sued other councils. The implications for the whole Shire are serious as all Byron Shire beaches are affected by erosion. What is wrong with rock walls? Rock walls reflect wave energy, which stirs up the sand in front that is then carried out into the deep water and away, thus accelerating the erosion of beaches. The recent marketing tagline was ‘Byron, naturally’ – is it natural to engineer our beaches like this? What’s the cost of rock wall and who’s paying for it? This section of rock walls is costed at $1.25M – for an interim structure. Ratepayers are paying 75%. Council admits that the “beach access” works will benefit the adjoining landowners, who are contributing $300,000. This is less than 25% of the cost yet approximately 40% of the wall protects private properties. Another 40% of the wall protects community land that Council is reclassifying for the purpose of selling into private hands. Isn’t Council under court order to protect these properties? Sandbag access works were undertaken by council in 2001 and legal action taken by residents after storms in 2009 resulted in a court order that commits Council to maintaining the interim protection – which is the sandbags – NOT to build rock walls. Is it true there will be other rock walls and sand pumping? 3.pumping sand from Cosy Corner to “nourish” Belongil. The beach engineering proposed will cost over $50 million to implement and $1 million a year to maintain. Byron would become like Noosa and other places where there has been loss of beach and it has to be constantly maintained by pumping – at great financial cost to Council and immeasurable cost to our other beaches, famous surf breaks and the tourism industry. 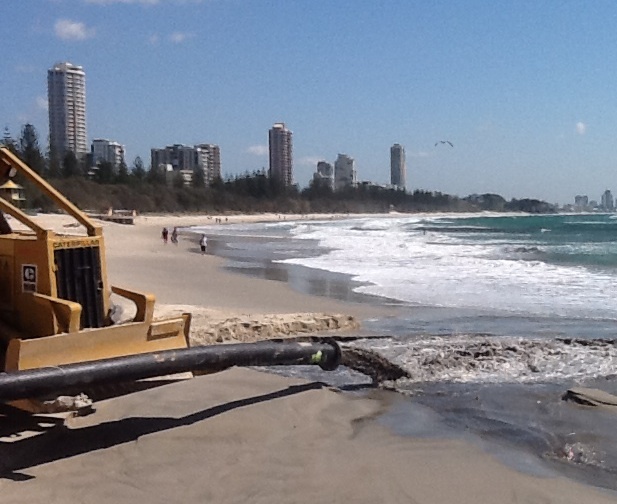 Sand pumping could significantly reduce sand supply to Wategos, The Pass and Clarkes Beach. The principles of planned retreat were incorporated into our Development Control Plan (DCP) in 1988. It allows the temporary use and occupation of coastal lands until coastline hazards threaten life and property, at which time development will have to be relocated further back from the escarpment or removed. Since the introduction of planned retreat, approval for new structures in the erosion zone has required them to be demountable to facilitate possible removal. Can the people at Belongil protect their homes? The NSW Coastal Protection Act clearly defines that temporary sand bag works can be undertaken but any permanent works must be the subject of an application and assessment process as defined in the Act. This process has not occurred with regard to the proposed (IBAS) rock wall at Belongil. The Byron Development Control Plan also says protection is allowed, “only where such works will have no adverse effect on any adjoining properties or on any coastal processes. Rock, concrete and like hard materials must not be used for the construction of beach protection works”. There is a history of owners attempting to protect their properties and many court cases have resulted. In 1996 the Land and Environment Court upheld Council’s refusal of an application by residents to build a rock wall to protect private property. Would Council have to compensate the landowners? Properties purchased before 1988 and which have not been renovated/extended may be eligible for compensation. Since 1988 all prospective land purchasers have been issued with a Section 149 Certificate that stated the land was subject to erosion and that development restrictions applied. In legal terms it’s a case of “caveat emptor” or “let the buyer beware”. Since 1979 all DAs required both Council and State approval. It is vital that residents get involved. Understand what is going on in your Shire with your money and act to defend our beaches. Councillors Rose Wanchap, Sol Ibrahim, Alan Hunter, Chris Cubis and Diane Woods who supported these works – and also Council’s General Manager Ken Gainger. ➜ NO RATES FOR ROCKS! You have a right to withhold your rates and let Council know why. Previous Do we want the Noosification of Byron? Next Why is Council building the bypass they rejected once before?